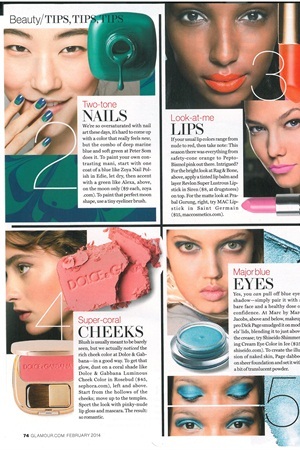 Glamour's February Issue discusses a fresh take on old colors: two-tone nails with a deep marine blue and a soft green. To do your own, paint first a layer with a blue like Zoya Nail Polish in Edie. Let dry and then accent with a green like Alexa on the moon only. TIP: To make a perfect moon, use a eyeliner brush.